She is an Esper of unknown level who is a part of SCHOOL group. Her ability name is Measure Heart. Her name has never been disclosed. She is usually described as a beautiful girl in a showy dress that looks for about 14 years old. She seems to be interested in Kakine Teitoku's plan of negotiating with Aleister. 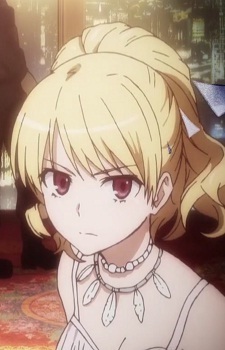 She shows reluctance when fighting an enemy when she can not foresee how their hearts are going to behave, and has has displayed a certain amount of mercy within the battlefield, showing something that might be described as respect in front of Shiage's and Rikou's protective behavior while they are faced with danger. Outside combat she seems to act a little frivolous, using her showy appearance to earn extra money. Note: In the staff credits in the anime she's listed as "Dress no Shoujo" (ドレスの少女, Girl in the Dress).